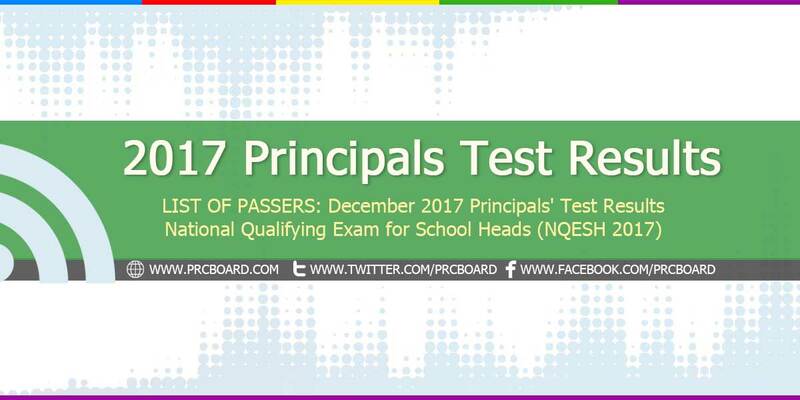 MANILA, Philippines (RELEASED) – The 2017 Principals' Test Results formerly known as the National Qualifying Examination for School Heads (NQESH) held on December 17, 2017 including the list of passers and related announcements are available at this website as the National Educators Academy of the Philippines (NEAP) and Department of Education (DepEd) officially released the results online few months after the day of examination. As announced, 5,111 out of 20,653 (24.75%) passed the exams. The 2017 Principal's Test are administered by NEAP, Bureau of Human Resource and Organization Development (BHROD) and all Quality Assurance Division of each Regional Office Quality Assurance Division (RO-QAD) on December 17, 2017 at designated Regional testing centers nationwide. Passing the Principal's test is one of the requirements for the appointment as school principal. It also serves as a mechanism for selecting school heads in public education sector. As per DepEd Memorandum No. 80 series of 2016, the Principal's Test is open to all aspirants for a Principal I position as required under DepEd Order No. 39 series of 2007 entitled "Modified Qualification Standards for the Positions of Head Teachers and Principals and DO No. 97 series of 2011 entitled "Revised Guidelines on the Allocation and Reclassification of School Heads Positions". In order to be qualified in taking the Principal's test, the applicant shall meet either of the following; one (1) year as Head Teacher; two (2) years as Teacher-in-Charge or Master Teacher; five (5) years as Teacher III or SPED Teacher; five (5) years as incumbent public school teacher who has five (5) years of managerial and supervisory experience in a DepEd-recognized private institution or Commission on Higher Education (CHED)-recognized Higher Education Institution (HEI). As per NEAP, results will be released through a DepEd Memorandum Order and will also be posted through their Facebook fan page followed by the distribution of printed Certificates of Rating for all test takers. Although NEAP did not disclose the exact date of release, it is expected to be out in 3-5 months. Meanwhile, NEAP is giving a hint weeks before the date of release. The 2016 Principal's test covered situational critical thinking questions relevant to the role of a SH anchored on the domains of the National Competency-Based Standards for School Heads (NCBSSH). These include topics from School Leadership; Instructional Leadership; Creating Student-Centered Learning Climate; Human Resource Management and Professional Development; Parent Involvement and Community Partnership; School Management and Operations; and Personal and Professional Attributes and Interpersonal Effectiveness. In order to pass the exams, the test takers must obtain at least 70% correct answers in all areas. On the most recent Principals Test conducted on April 2017, 388 out of thousand examinees passed. Christian N. Sango from Region 11 topped the exams followed by Benedick N. Damaso (Region 1) and Jerome O. Ramirez (Region 3). During 2015 Principals Test, a total of 2,195 out of 18,574 examinees passed or an overall passing rate of 11.82%. The National Capital Region (NCR) got 14.17% overall passing rate. Region IV-A (CALABARZON), region with the highest number of examinees got 11.49% passing rate while Region 8 Eastern Visayas got the highest passing rate for having 15.91%. To receive up-to-date news about 2017 Principals Test results held on December 2017, we advise our visitors to bookmark this page, visit DepEd official website or follow us at our social media pages via Facebook and Twitter. Where can i get the exam rating? Can I have the copy of my rating? Where to know my/our rating? Are you going to send us our rating individually? Good ev. Where can I get result of rating?